In our area avocados are readily available, so we use them in everything. We top our breakfast eggs with slices of avocado, stuff our tacos, and make guacamole weekly! I grew up on my uncle Mike’s avocado farm, and as kids we would play hide – and seek in the orchard, along with the rats and snakes. We played for hours but also ate lots and lots of avocados. As I visit my farmer’s markets weekly, I do look for fresh produce, and corn was available. So, why not add it to your avocado-guacamole. Melissa’s produce provided me with fresh avocados and all the fixins. I rarely review products, but how could I possibly pass this one up. 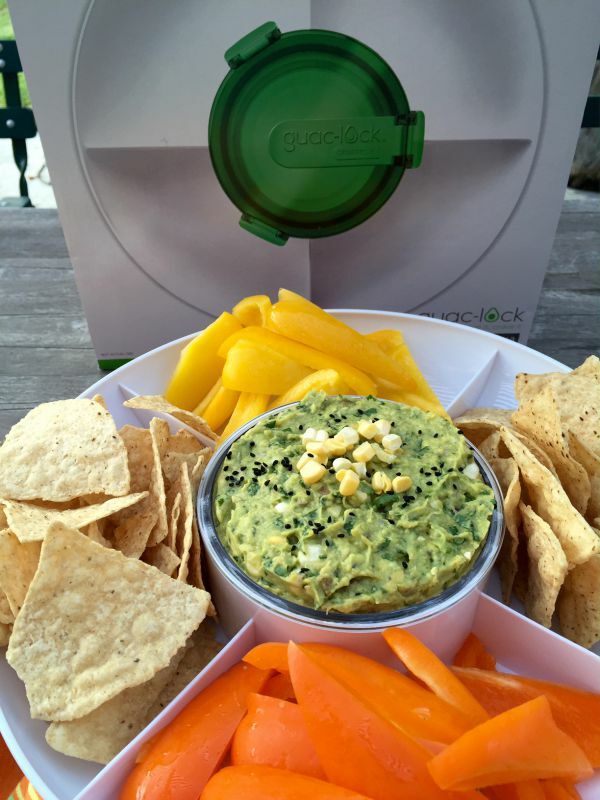 This is the Guac-Lock Bowl and Serving Piece and it preserves your guacamole for up to 3 days. It’s easy to use, with few pieces to work with. I did have to read the enclosed instructions, but once I assembled the pieces , they fit together beautifully. And it keeps your guacamole freshly preserved. 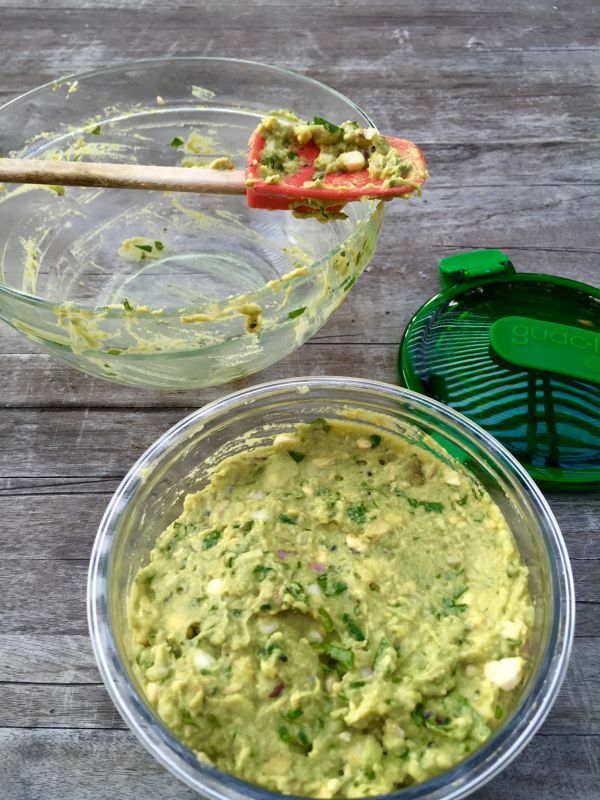 It locks in freshness so you can make your guacamole ahead of time. The container also serves as your serving dish – making it so handy. Best of all, it’s made from shatterproof, odorproof and dishwasher safe, top rack easiness. Best of all, it takes the worry out of last minute rushing. Here are the pieces, clean bright and colorful. They snap together beautifully, and once you do it a couple of times, assembly is quick! My recipe is fresh and delightful for a summer get-together, using the best ingredients you can find. Once you have your recipe completed, fill the container with your favorite dip and smooth with a spoon. Pack tightly and check sides to be sure there are no air pockets. Place cover on container and lock the 3 clips. Leave the lid open. Place the container on the elevator and push down gently. Squeeze out the air until the guacamole appears at the top hole. Close the tab to form an air-tight seal and store in the refrigerator without elevator attached. Before opening, open the large tab first, then unlock 3 clips. Your guacamole comes out green and vibrant, just as it you made it that day! Place it in your dish, and add your chips and vegetables! I like to mix up my presentation with a little healthy and a little naughty. 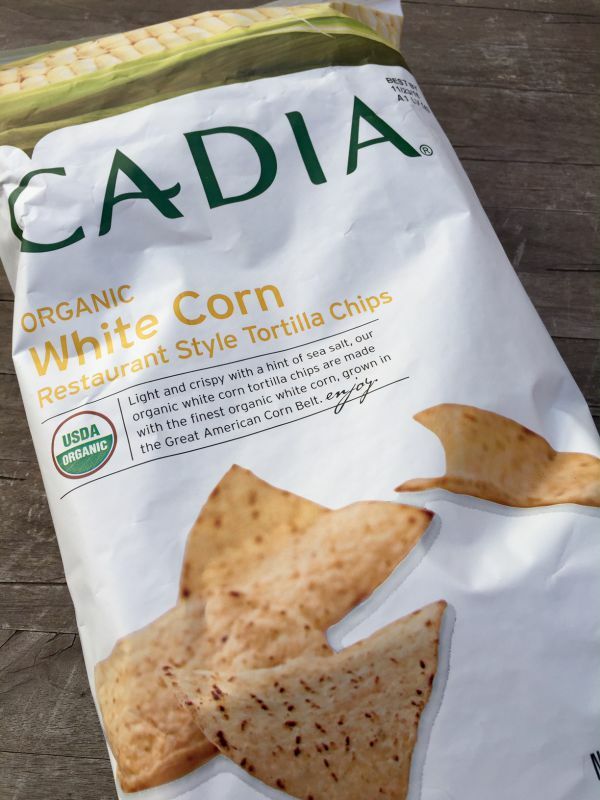 These are the organic chips I served with all my dips. Cadia puts out a great brand. There's nothing like fresh corn anything! Add it to your guacamole and it's refreshing and sweet! This recipe can be easily doubled for a large crowd. Add the remainder of ingredients. This post was sponsored in part by Guac-Lock and Melissa’s Produce. This is my opinion and original recipe. I only endorse products that I approve and have a purpose making life easier in the kitchen. 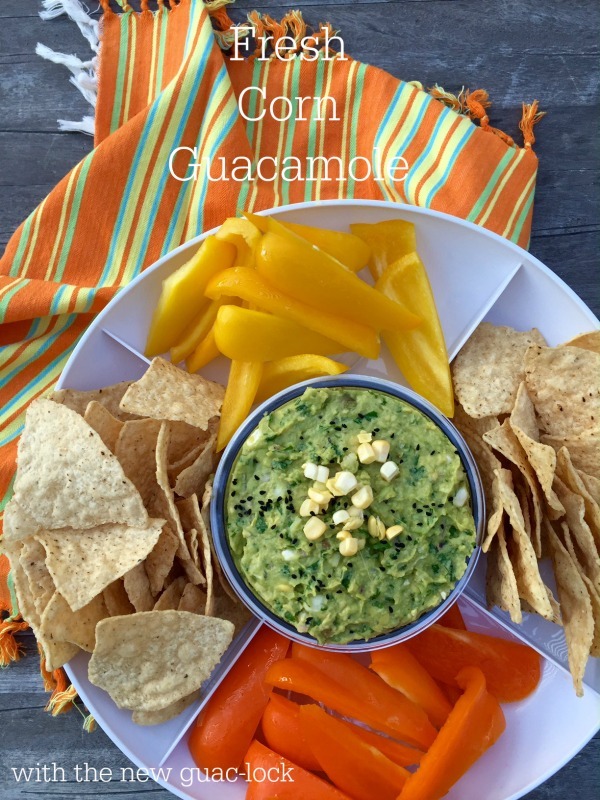 Love the fresh corn in your guacamole. Hi Cathy, The Guac-lock actually worked! I love coking from my pantry or refrigerator ingredients, always a surprise when things work out.